Redwood City police on Saturday are investigating an officer-involved shooting. Marianne Favro reports. Redwood City police on Saturday are investigating an officer-involved shooting where they say a woman reported a man pacing in front of a Wells Fargo ATM bank on the 1900 block of Broadway. Several officers say they tried to convince the man to surrender. 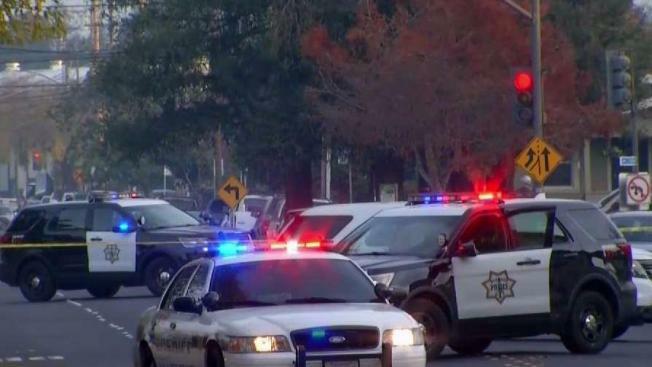 "At some point, he stopped and took a combative stance, pulled the gun out and fired at officers," said interim Redwood City Police Chief, Gary Kirby. "That's when officers returned fire." Officers attempted to give the 30-year-old Hispanic male CPR but he died at the scene. According to officials, the man had on-and-off contact with police officers since he was eight and had prior convictions in Redwood City. "The gentlemen was not being compliant and he pulled something out of his sweater and at that point they started shooting," said Ignacio Jimenez, a witness who was walking his dog when the shooting happened. Police say they called in a street crimes team that specializes in working with suspects that have mental health issues. Investigators say they will remain at the scene for the next four hours to process the scene.